I've been hampered by really bad weather so far. I did take a quick look at the moon through all three Eyepieces and didn't see anything that would distract me at the edges of the F.O.V. - Only very minor coma (@ f/5 though the 38mm . No diffraction rigs, nothing bad jumped at me. I was concerned that the eye relief on the 25mm might be a issue, but that turned out to be O.K. (I wear glasses) Cost / Benefit ratio very good so far,,,,,,,,Jury is still out long-term though. Well made and well worth the money! These are very high quality eyepieces at a great price. I bought these for my daughter's telescope and I was extremely impressed with the quality sharpness, clarity and build of these eyepieces. We are extremely happy with the product and impress with the value. I bought this set to go with my new 8SE and William Optics 2" diagonal. Totally impressed with this set! 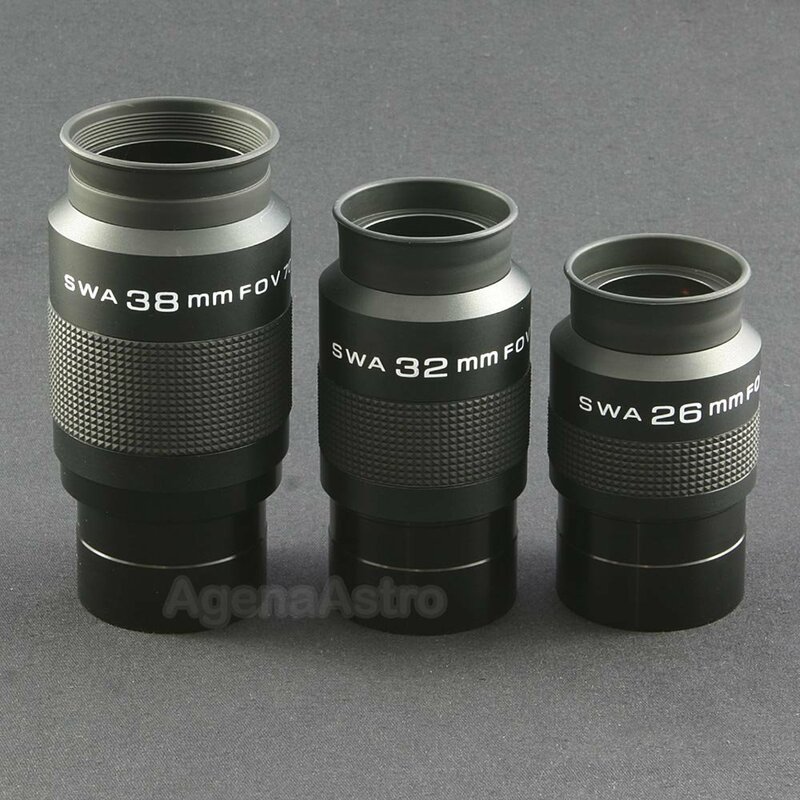 These eyepieces work well in F6 telescopes, and very well in F6.5 and above. Very good engineering and manufacture. I have and use TV and UO with similar AFOV. But for star parties, Astronomy Merit Badge, Grab and Go, other "many hands, eager hands" uses these just can't be beat. The set of three costs less than one of "the best". Peace of mind combines with the Agena SWA very good optics to create comparable views in the central 2/3s of the field, with the surround enhancing the experience. Include Agena's case, excellent customer service, and prompt free shipping and you are at 5 stars. Review by JRock of Columbus, Ohio. I bought the 38mm used and loved it so much I almost immediately bought the 32mm and 26mm from Agena. For the price you cannot beat these eyepieces, period. I found myself using these over my other eyepieces costing 3X as much. Edge to edge clarity and they produce a quality image through my 9.25" SCT. These are perfect for star parties or public events were you can get spectacular views and not worry about your $300+ eyepieces. Review by slipfit of Millersville, TN. Using these eyepieces is like looking thru a big picture window. You feel like you could almost step thru into a new world. Review by DIM104 of Athens, Greece. they was specific almost in the all field. The deformity in utmost the field they is small and does not influence the observation. I believe that I would change to them only with Nagler. I had read about the advantages of these SWA 2" EPs. I was really looking forward to getting the immersed in the sky effect. I was not disappointed. For the money, these are great. I would not hesitate in recommending these. I use these with my medium speed 80ED and the FOV and eye relief are very nice. Review by geokolb of Phoenix, AZ. Very good price for a good set of eyepieces. Bear in mind these are no Naglers or Panoptics but at a fraction of the price, you'll get your money's worth.